Marguerite Moore, Pat Ciprian, Marie Jones Francis, and Linda Croft in the front yard of the Jones-Francis Maternity Hall, located at 621 East Sixth Street in Georgetown, an historic black neighborhood in Sanford, Florida. The house was originally the home of Reverend John R. Hurston, the father of Zora Neale Hurston. This photograph was taken on April 4, 1975. Marie Jones Francis, the "midwife of Sanford." Francis left behind a successful hotel and restaurant she owned in Sarasota in 1942 to return to Sanford and become a midwife. World War II caused a shortage in doctors and nurses, so Florida's Children's Bureau sent Francis to Florida A & M to acquire her practical nursing license in 1945. She specialized in premature babies and returned to Sanford to aid her mother, Carrie Jones, at Fernald-Laughton Memorial Hospital before they opened the ward in their home. "When her health starting failing," she recollects in a newspaper article, "I took over." Francis converted her house at 621 East Sixth Street to also serve as a maternity ward, where she delivered over 40,000 babies over her 32 year career. She became a midwife in the same vein as her mother, Carrie Jones, and together they ran the Jones-Francis Maternity Hall in Georgetown. Francis served her community in several ways. She delivered babies for both white and black families from Seminole County, primarily patrons who either preferred natural births or could not afford deliveries at a hospital. In the 1950s, it cost $70 to stay nine days where soon-to-be mothers were taken care of, including three home-cooked meals; mothers were also taught basics in infant care. Francis was assisted by her sister, Annie Walker, who did the cooking. If a mother could not afford the costs, Marie Francis would not turn her away. "There's a lot of charity here but I wouldn't feel good taking money and knowing the mother can't eat when she leaves here," Francis mentions in a newspaper article. The house and ward also served as a school, where Marie Francis taught nurses the art of midwives. Nurses would come from across the state to learn how to delivery infants naturally. A heavy burden on a single working mother, Marie Francis had three daughters, Cassandra Clayton, Daphne Humphrey, and Barbara Torre, Clayton and Humphrey became school teachers and Torre became a purchaser at Seminole Memorial Hospital. The "Midwife of Sanford" Marie Francis and her family contributed to Sanford's development and well-being for the better half of the twentieth century. Original color photograph, April 4, 1975: Private Collection of Daphne F. Humphrey. Digital reproduction of original color photograph, April 4, 1975. 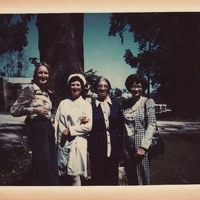 “Marguerite Moore, Pat Ciprian, Marie Jones Francis, and Linda Croft at the Jones-Francis Maternity Hall.” RICHES of Central Florida accessed April 24, 2019, https://richesmi.cah.ucf.edu/omeka/items/show/2920.